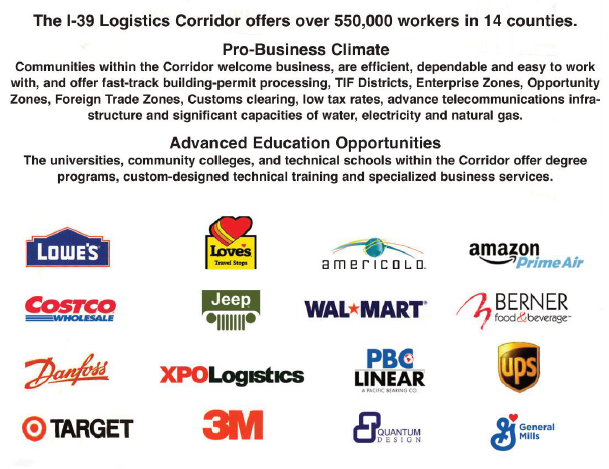 To corporate logistics managers, I-39 is more than just a highway. It’s a key artery for shipping goods and services, and it easily connects to rail, air and river transportation. With wide-open roads and lots of available land, it’s easy to see why this is a rising star. Sara Lee’s regional mixing center in Rochelle, Ill., is much like a beehive; the 400,000-square foot distribution warehouse is constantly abuzz. Every day, trucks packed with frozen foods come and go. They arrive from processing plants around the Midwest and depart to the Midwest and to the West Coast. Sara Lee’s largest American distribution center is in Rochelle for good reason: The warehouse is just minutes from two major interstates and Union Pacific’s giant intermodal rail hub. Through these routes, foods are shipped to any location overnight or in less than two days. Every minute counts, when you’re moving as many as 200,000 cases of food every day. Rochelle’s wide-open access is in striking contrast to the crowded streets around Sara Lee’s global headquarters in suburban Downers Grove, Ill. There, trucks compete with commuters for space on clogged highways and streets. Sara Lee was ahead of the curve, but I-39 has garnered increasing attention as a logistics corridor over the past decade. The highway connects central Illinois with Wisconsin, bisecting highways that run west to Iowa and east toward Indiana and Chicago. The corridor is more than just pavement. Years of investment have equipped it with rail, air and river transportation assets, all easily accessed through the highway. Good logistics – moving things from Point A to Point B with maximum efficiency – requires speed, and that’s something the I-39 corridor can offer. As local economic development leaders see it, the corridor is a wide-open pipeline loaded with amenities that any logistics-dependent business could desire. They’re working together to sell the I-39 corridor’s transportation assets to Chicago-area developers, who can bring new warehouses and major employers to town. And what’s out here is opportunity. Along I-90, near O’Hare International Airport, nearly 166,000 vehicles pass by every day. By contrast, in Cherry Valley, Ill., about 53,000 vehicles pass the interchange at I-90 and I-39 every day, according to the Illinois Department of Transportation. About 30 percent of that traffic – nearly 16,000 a day – is truck traffic. South of Rockford, where Baxter Road meets I-39, nearly 30,000 vehicles – about 9,000 trucks – pass by each day. In her day job as director of the RAEDC, Fadden knows what those numbers mean to a logistics company: Time and money. Trucks have easier access to their destinations when roads are less congested. And, thanks to the area’s manufacturing heritage, there’s ample workforce trained in moving goods quickly and efficiently. Fadden assumed leadership of the corridor association in 2007, at a time the group was celebrating new businesses and expansions. More followed. Lowe’s put a 1.4 million-square-foot facility near Bypass 20 in Rockford. Staples built a 400,000-square-foot distribution center in the Beloit, Wis. Gateway Business Park. 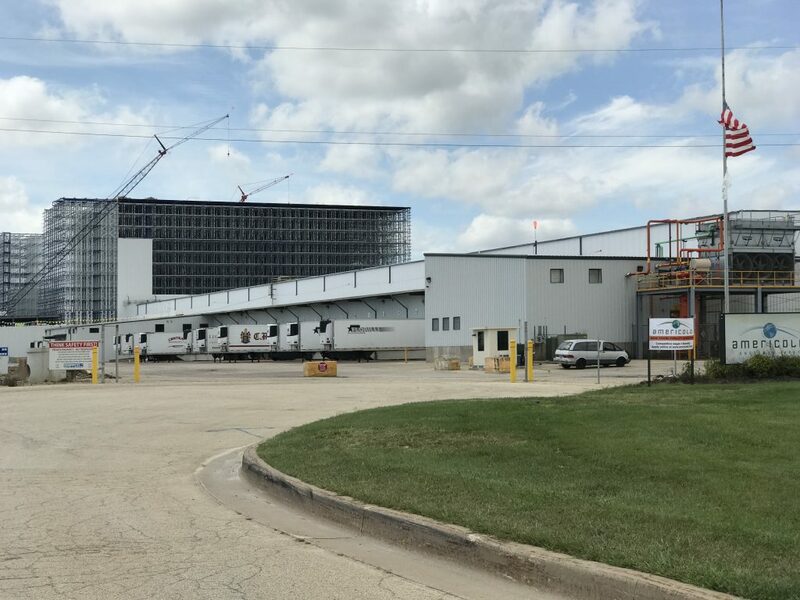 Target built a 1.5-million-square-foot distribution center in DeKalb, Ill. Sara Lee has twice expanded its Rochelle facility, and 3M is finishing a fifth building at its DeKalb campus. Fadden says the association has achieved its initial goal. The association’s first step in promoting the region was to place ads in high-profile publications and directories used by commercial developers. Pooling resources enabled smaller communities to join the promotional effort and market themselves. The association also sponsored logistics studies on the area, compiling what Goode calls a “library of information” that makes it easier to sell the region. Question: What has 700,000 square feet of warehouse space, 67 truck bays, shelters up to seven rail cars and is just a mile from I-90/39 in a logistics-friendly neighborhood? Answer: A warehouse in Janesville, Wis., which, in a former life, was a just-in-time parts supplier to GM. It’s newly remodeled, bright, clean and ready for tenants. Walking through the warehouse on a cold February morning, he points out how the space, subdivided into three warehouses, has high ceilings for cranes, is connected to a railroad track and is in move-in ready condition. It’s a perfect spot for light manufacturing and located close to the highway.Gregg Tatge, business resource manager for Helgesen Development, Janesville, helps companies to acquire the incentives they need to move into a space like this. Bill Mears knows the value of that location. From his Janesville office, just up the highway from Helgesen’s empty warehouse, the commercial real estate broker watches trucks go up and down I-90/39 all day long. He’s also within easy view of two trucking centers, one for Farm & Fleet, the other for Grainger, an industrial supply company. In a booming economy, something like the former GM supply space would have been snatched up in a hurry, says Tatge. The company also has several new developments ready to go, with plans drawn and permits signed, just waiting for clients. Location was a key factor for Lowe’s, when it built a 1.4 million-square-foot distribution center in Rockford in 2007. From Bypass 20, it’s just minutes from I-39 and I-90. About 800 employees pack up nearly 32,000 house fans, lawn mowers, paint buckets, weed-whackers and other supplies into truckloads each day, sending them off to stores throughout Illinois, Iowa, Wisconsin and Michigan. Years of investment have readied the area for more than efficient trucking. With a cargo and passenger airport in Rockford and an intermodal rail hub in Rochelle, companies have options. Cargo planes at RFD arrive and depart throughout the day and night. Situated just south of Rockford, the airport is minutes from Route 20 and I-39. Similar to the way the corridor association promotes the region’s lack of vehicle congestion, O’Brien touts open skies. It helps, too, that the airport is situated on more than 3,000 acres of largely undeveloped land at the edge of Rockford. RFD ranks 21st in landed cargo weight, among airports in the United States, and for those cargo shippers already here – UPS and DB Schenker – the advantages are obvious. The UPS facility handles nearly 30 daily flights and moves some 121,000 packages every hour, more than anyplace else in the world, except its Louisville, Ky., hub. O’Brien dreams of filling his runways with more cargo planes, and he’s reaching out to international carriers, selling them on the airport’s ability to move goods faster and more efficiently than O’Hare. RFD holds the corridor’s only foreign trade zone status, a government designation that allows carriers to expedite cargo through customs. Atlas Air has tested several flights to Rockford, and O’Brien says he’s offering other companies a chance to bring test flights through the airport.“[International carriers] find it initially hard to imagine how you can land a plane at RFD, offload its cargo and deliver it – by truck – to a plane at O’Hare, faster than they could have taken the product into O’Hare in the first place,” says O’Brien. “They can save a minimum of 30 minutes to 3 hours, with a cost savings of $15,000. It doesn’t seem to make sense.” But it actually makes a lot of sense. With its crisscross of rail lines giving it a competitive advantage, Rochelle, population 10,000, operates independently from the corridor association. Its rail lines lead to the Union Pacific’s intermodal rail hub, southwest of the city. The hub serves intermodal freight – train cars that also piggyback on semi trucks. At full capacity, the hub can process some 25 trains and 3,000 containers a day. That’s a lot of freight, and Rochelle offers another advantage in the transportation game: it sits at the junction where I-39 meets I-88, offering speedy access north, south, east and west. Anderson sees Rochelle as an up-and-coming hotspot for data-based logistics, too. Allstate Insurance and Northern Bank & Trust store massive amounts of digital data at their facilities in a new tech park adjacent to I-39. With a high-speed, fiber-optic broadband network available throughout the city, there’s opportunity for others to join them. Through those efforts, Rochelle has attracted new distribution centers and helped motivate others to expand. Sara Lee has expanded its facility twice since 2007. The Rochelle Foods/Hormel plant has expanded three times, and a company that builds rail cars is constructing a new manufacturing plant. Anderson currently has nine separate projects in the works.In 2008, Anderson developed TEAM ROCHELLE, to improve communication on new developments. The consortium includes local colleges, elected officials and city staff who contribute their resources and expertise. Ottawa, Ill., is another small town with a big story to tell to potential distributors. The city of 19,000 people, on the Illinois River, has landed several big projects since joining the corridor association. A new PetSmart distribution center opened in 2005, followed by a Kohl’s distribution center in 2008. A titanium powder manufacturer expects to open this year. “The ability to let people know the benefits of your area is huge,” says Noble. Like Ottawa, smaller Illinois cities like Dixon, Monroe Center and Mendota are benefitting from joining forces. Through the corridor association, they attract attention they otherwise couldn’t. DeKalb, too, has found value in collaboration. Located less than 15 miles east of Rochelle, along I-88, it’s close to Chicago, yet in easy reach of I-39. Small cities aren’t the only underdogs finding value in the corridor association. 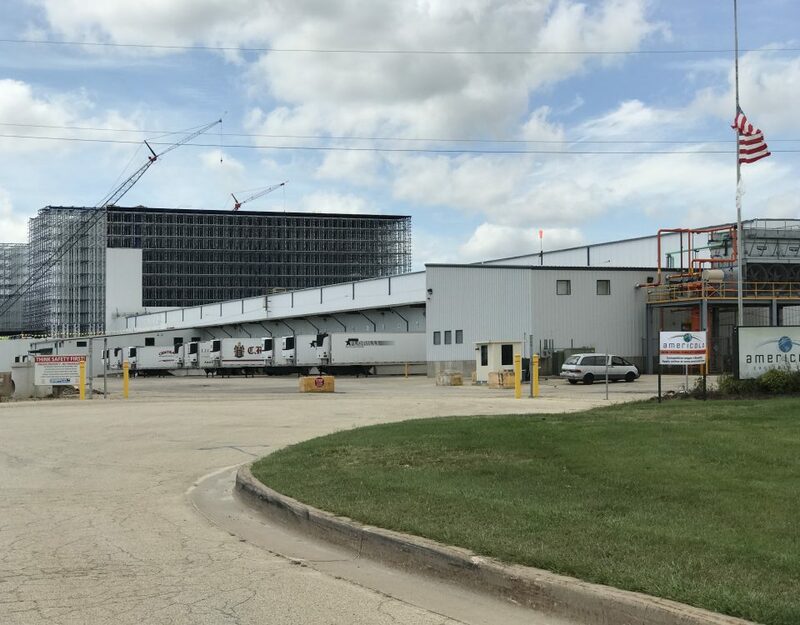 Smaller companies like Reload Inc., Rockford, benefit from the chance to improve business connections.Materials producer 3M has long had a presence in DeKalb, and is completing the fifth building on its campus. Food producer Nestlé has an 868,000-square-foot distribution center, while tire maker Goodyear has a 1 million-square-foot distribution center. 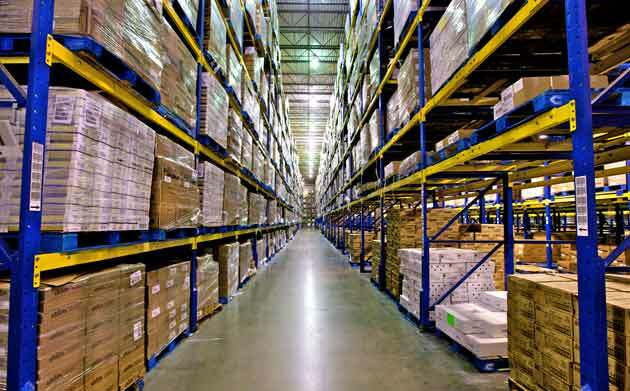 In 2005, Target joined the area, with a distribution center totaling 1.5 million square feet. Owned by a national transportation company, Reload specializes in transferring goods between semi truck and rail car. It doesn’t work with the Rochelle hub, but Bob Cunningham, general manager for Reload, says the highway and nearby rail lines offer easy access for his clients. Not surprisingly, development has been slow, since the recession began in 2008, but leaders say things are picking up. “The past two years have been kind of quiet,” says Fadden. “But prior to that, we tracked more than 8 million square feet of development taking place within the I-39 corridor.” Ample space remains. Back at RFD, director O’Brien is dreaming big. As he continues to spread the word about his airport’s assets, he knows that I-39, too, will play a key role in the region’s future.